Despite the brilliant performance turned in by Nikola Pekovic (aka, The Godfather) in last night’s win over San Antonio, most Wolves fans would agree that the center position remains an area of concern. One (or two or three or four) quality performance from Big Pek isn’t enough SAMPLE SIZE to alter my opinion on this seeming truth. One possible solution that is often discussed (and occasionally utilized) is to slide Kevin Love over to center. On this Wolves team that recently drafted a power forward with the second overall pick, there’s a glut that would be partially lessened if Love moved over to the low block on defense and allowed Williams to play his natural position at the four. But, as I am sure you’ve read or heard, this is not a winning formula. Look at the Lakers and their dynasties. The common denominator is a Herculean Center that dominates the paint, fouls out his opponents, and inevitably blings out his hands with championship jewelry. The Celtic dynasties included the best defensive center of all time, Bill Russell, a true rim protector whose blocked shots would often double as outlet passes to Bob Cousy. Their 1980’s dynasty had a huge and dominant front line of Bird, McHale, and The Chief, Robert Parish. And Michael Jordan’s Bulls, while offensively-led by star wing players, always had seven-foot goons to protect the paint. So, is there a championship-tested example of an undersized center? 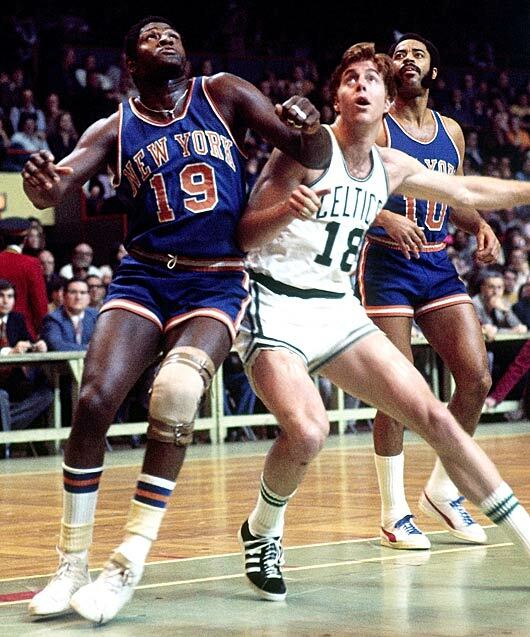 There is actually, and Willis Reed’s Knickerbocker teams of the early 1970’s are widely considered to be one of the best true TEAMS in league history. 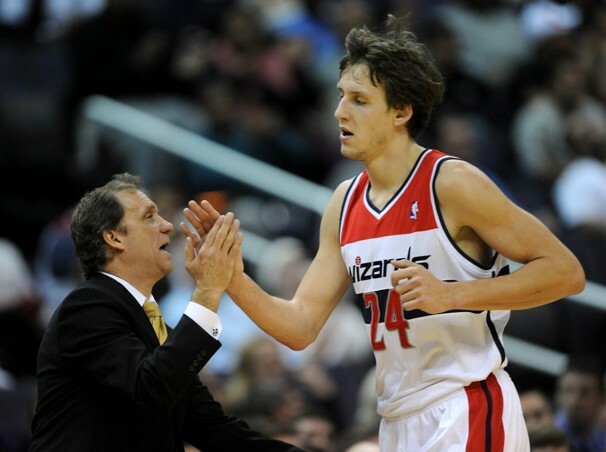 Reed was under 6’9″ without shoes on, much like Kevin Love is. Harvey Araton of the New York Times recently wrote one of the best sports books I have ever read. When the Garden was Eden goes into detail about Coach Red Holzman’s decision to play Reed at center against goliath centers of the 1970’s, and how a seeming weakness would sometimes prove to be a strength. First was the debate of whether to play Reed at the 4 or the 5. In the early part of his career, the team made an aggressive trade for Hall of Fame center Walt Bellamy. “I think they thought because Bellamy was bigger that I would be better as a forward,” Reed said. Throughout his career, he was alternately listed at 6’10” and 6’9″, but Holzman had measured him at Grambling in his socks at a shade under 6’9″. The conventional wisdom was that if they were to contend for a title, the Knicks would need more size at the position to confront the likes of Bill Russell and Wilt Chamberlain. Araton, Harvey. When the Garden was Eden. Harper Collins, 2011 (p. 46). Sound familiar? Remember when Ryan Hollins started over Kevin Love? (!!!) Remember when Darko Milicic got serious tick on the Wolves? (What–that’s still happening?!) The concerns about Reed playing center sound much like the Wolves’ own obsessions over length up front and the need for a true center. So, how did things work out for the undersized Knicks? Well, a quick Google search can tell you if you didn’t already know that they won two championships with Reed playing center. Araton describes the effective strategy of matching up Reed against legends Alcindor and Chamberlain, en route to the 1970 title. Offensively, Reed was a nightmare for the UCLA grad. The young Alcindor was loath to switch on screens, and against a team with as many shooters and willing passers as the Knicks, that sort of immobility amounted to playing too long on the railroad tracks. Reed would step outside for jumpers, and when Alcindor deigned to challenge him, he would fake the jumper and go hard to his left. In Game 1, for reasons that were related to his health, his head, or both, Chamberlain refused to move away from the basket to contest Reed’s mid-range jump shot. Reed scored 25 points–in the first half. The teams split the first two games in New York, but Reed erupted again for 38 points in Game 3. If Willis Reed could pose matchup problems against Abdul-Jabbar (then Alcindor) and Chamberlain–arguably the two greatest centers in world history–could Kevin Love hold a similar advantage against modern NBA centers? I recently wrote about the modern NBA center position, and the dearth of bigs who actually dominate games with post play. Love has a low center of gravity and can hold position on the block in those instances when a big man decides on a post move. Would these players enjoy chasing Love out to 23-feet, where he’s currently hitting 40.4 percent of three-point attempts? Perhaps bigger defenders would guard Derrick Williams, since he’s showing himself to be more of an interior scorer than any Wolf not named Pekovic. But so what if they do? D-Thrill would blow by taller, slower players and create more highlights than he already does. It’s an idea worth exploring. Share your comments, and go read Harvey’s book if you enjoy NBA history. Or team sports. Or good writing. The Wolves continued their strong play against Texas this season (*ahem*, Houston–I know) with an 87-79 victory over the San Antonio at Target Center. Love had a workman-like 18 & 16, while Rubio put up 18 & 10 on 7-12 from the floor. The Wolves were the better team tonight. It showed. They owned it. It was the first game this season against against an upper-tier team where the players knew it was theirs to lose. And they won. Andy G captured it best in a POST-GAME TWEET. Yes, there was sloppy play, unforced errors, and plenty of potentially costly mistakes, but the Wolves finally looked and played like they were vets who had been there before, like they knew they had the situation handled. Their calm, cool, confidence, combined with execution when they needed it, that put Duncan & co. away and sealed the deal for the Pups. CORRELATION OR CAUSATION: Darko was out, Pek played like the legit NBA big we were expecting when we drafted him, and the Love/Pek duo gave Duncan/Splitter/Blair fits on the glass. Seriously, Pek has been showing signs recently–signs of doing things we’d all written off. Small sample, for sure, but is this guy finally coming around? What should the rotations look like if he is? It was great to see Mike Beasley back on the court. I’m an unapologetic Beasley fan who really believes Mike will help this team once he settles into Adelman’s system. That wasn’t happening from the bench. Beasley only shot 3-11 and definitely showed some rust, but he looked healthy and attacked the basket hard. We can’t get enough of that from him and Derrick Williams, both of whom will start getting more calls as the team wins more and begins to earn respect around the league. It was great to see Martell Webster back on the court. I wish I could be as optimistic about Webster as I am about Beasley, but he just doesn’t look healthy. Back injuries tend to linger, and they really hinder lateral mobility. Case in point, Martell’s gimpy jog around the perimeter didn’t inspire confidence. He has, er, unique hair and he stuck a nice trey with a hand in his face during his brief run tonight, but I’ll be surprised if he’ll be healthy enough to take Wes Johnson’s minutes at any point this season. Here’s hoping I’m wrong on this one. That’s all for now folks. It’s Friday night and I’m gonna go get my fun on. After penning his name on a gigantic four-year contract extension (approximately $62 Million over 4 years, with player option after third year) Kevin Love went out and played a near-perfect game of basketball against the defending champion Dallas Mavericks. Spearheading a dominant second half for his team (53-36) Love posted 31 points, 10 rebounds, 2 assists, 2 steals, and 2 blocks without any of the disruptive, gimmicky tactics that I whined so much about the other night. Love shot 6 treys and hit 4 of them, he played hard defense all over the floor (not his type of matchup when Yi draws him outside the paint) and provided the uber-efficient productivity that makes him special. One game in, Love looks well-worth the dough. Beating Dallas at its home court is a bit less (okay, WAY LESS) impressive when Dirk is on the sidelines with a knee injury. The Mavs started this game with some red-hot shooting, particularly from Jasons Kidd and Terry, Yi Jianlian, and Rodrique Beaubois. I wondered whether the Wolves (shorthanded themselves without Ridnour, Barea, Beasley, Webster, Miller, and Lee) would have enough legs to ramp up the defensive pressure and hang in this game. They did. Rubio in particular was relentless in attacking the defense, staving off defensive pressure, and constantly seeking out steal opportunities (4 times successfully) for 46 crucial minutes of point guard play. Only for a short two-minute stint of Wayne at the point did Ricky get a breather. My one problem with Rubio’s game (no, not his 7 turnovers; those are part of the package for this type of playmaker) is that he shot too much. His jumper is quickly molding into its Euro League form, with his field goal percentage now plummeted to 38.6. He shot 4 of 16 from the floor, tonight. On too many possessions, Rubio’s first decision was to penetrate the lane and look for his own shot. It wasn’t working for him tonight. His overall efficiency (17 points on 16 shots) was partially saved by an ability to draw fouls (8-9 FT’s) that is second only to Love on this team. Ricky stuffed the stat sheet with 17 points, 12 assists, 7 rebounds, and 4 steals. Triple doubles are in this kid’s future. * I lobbied for Anthony Randolph to take the center minutes from Darko and Pekovic. Rick Adelman disagrees, obviously, because Randolph played 9 minutes tonight, while Darko and Pek combined for 44. Darko had an efficient 8 points, 7 rebounds and a whopping 7 blocks in 24 minutes. Pekovic shot 4 for 5, for 13 points and 7 rebounds in 20 minutes. Randolph? 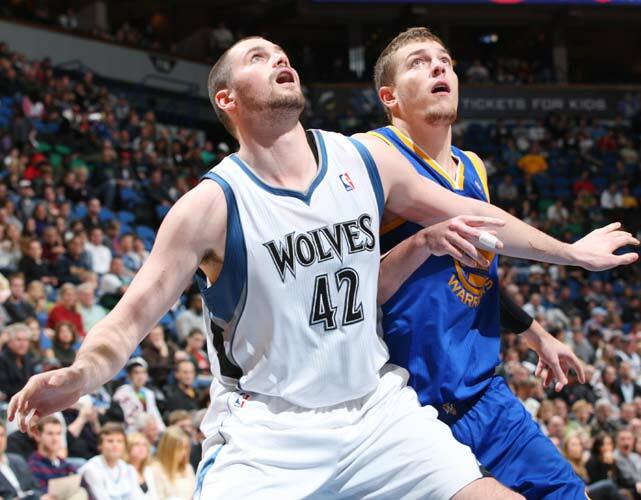 The only Wolf in the minus column (-5) with a 1 for 4 shooting night. Perhaps Coach knows what he’s doing. * Lamar Odom looks horrible. He is notoriously inconsistent, but tonight looked cranky, out of shape, and not at all ready for an NBA basketball game. As he has done throughout his career, he took the bait on jump shot opportunities, and put together a 2 for 14 shooting performance in just 16 minutes of action. Mavs fans must miss them some Tyson Chandler. * Solid game for Derrick Williams. He is not a small forward–that much should be obvious by now–but on plays when Rubio was cycling the half court with the ball, D-Thrill found opportunities to dive in the paint. He was rewarded with Rubio passes and easy hoops were had. On one instance, it was Rubio-to-Williams-to-Darko without the ball touching the floor. On another, Williams finished it off himself. 10 points (4-7 shooting), 6 rebounds, 2 assists, and 0 turnovers in 25 minutes is good work for a rookie playing out of position. Kevin Love just signed a 4-year deal with a PLAYER OPTION (NOT insignificant) after 3 years. The deal is reported to be in the $62-64 million range. Details here. UPDATE: Kevin over at Howl at the Moon has an awesome facial hair vid up on his site in celebration of the K-Love deal. Go check it out!